My first trip to a real bike shop resulted in the purchase of a brand new Raleigh. I distinctly remember straddling the bike in the shop, tilting from side to side as my toes reached for the ground but the training wheels caught me just in time. I also remember the spokey dokes and streamers I selected from the pegboard display — and the gleeful feeling that bike provided me with while growing up. The bike that my father and I wheeled away from the shop was blue and beautiful, and made worthier in my eyes by the jealousy of my older neighbor, Stephen, who insisted that “Raleigh bikes are the best bikes in the world.” Soon afterward, dad even removed the training wheels. The feeling of freedom that bicycle gave me, the speed that whipped my ponytail into knots as I rode, the badges of honor resulting from crusted blood on my post-crash knees — those memories and feelings engrained that Raleigh, my first bicycle, in my memory forever, and founded an obsession for bicycling and the Raleigh brand that has followed me ever since. Given the robust history of Raleigh, I suspect I am not alone. The course of bicycles and cycling changed for the better with that one sentence. Impressed with his purchase, Bowden not only recovered from his illness but also decided to purchase interest in the small company that made his bike. In December 1887, the Raleigh Cycle Company was established and the bicycle began its rapid journey towards mass production. Just nine years later, Raleigh moved into a 7.5 acre factory in the town of Radford and established the largest bicycle manufacturing plant in the world. The newly public company employed 850 workers and pumped out over 30,000 bicycles per year. In 1902, with the purchase of Sturmey Archer, Raleigh set itself up to offer 3 speed internal gearing on its bikes. Sturmey Archer’s 3 speed internal hubs, feared today by head mechanics everywhere due to their complexity and intricacies, were to become legendary in their own right. Although the 1930s brought depression to much of North America and Europe — hitting industry and export sectors particularly hard — Raleigh fared relatively well, purchasing Humber Cycles in 1932 and continuing to profit as the Depression years pressed on towards the war. The three-speed bicycle was gaining popularity as a vehicle for transportation and the bicycle settled into its utilitarian role. 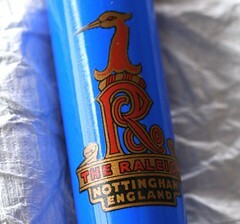 During the 1930s Raleigh also tried its hand at automobile and motorcycle manufacture, but by 1938 the company dropped its motorized products and turned its concentration inward to pedal power. Raleigh production facilities were relinquished to munitions manufacture during the war years, but as the war ended Raleigh boosted its bicycle production significantly and despite — or perhaps because of — shortages in fuel, achieved an annual export of nearly 750,000 units. This trend continued into the 1950s until the bicycle market had a change in prosperity and Raleigh sales plummeted. Raleigh suddenly found itself floundering and turned to motorized vehicles once again, this time building mopeds and motorized scooters to try and bump up sales. Things did not start improving until Raleigh took over Triumph and Birmingham Small Arms, and then joined forces with Tube Investments (TI). The acquisition of Carlton Cycles, a specialty race bike manufacturer, occurred in 1960. A need to increase sales pushed Raleigh to consider and ultimately try several new bicycle designs. The 1960s saw Raleigh come out with a version of Dave Moulton’s small-wheeled cycled, marketed with the slogan “World’s most sophisticated His and Hers Bicycles.” The RSW and RSW Compact featured 16″ wheels with “wide profile tires to cushion bumps,” 3-speed gearing with twist grip shifting, a quick release saddle and stem, fenders and a detachable carrier bag. The compact model folded for easy storage. The RSW was sold as a commuter and shopping vehicle — and proved to be a popular design. Unfortunately for Raleigh and Moulton, the direct competition between the companies meant that neither enjoyed much profit from the commuting bike design. In 1967 Moulton threw in the towel as Raleigh purchased the company. The following year, Raleigh’s Twenty Folder — an RSW-like model with caliper brakes, a kickstand and pump — became the sales booster Raleigh had been waiting for. Raleigh’s next bold design move came in the form of the ultra-hip (and dual adult and kid-friendly) Chopper. Following the coattails of companies like Schwinn, Raleigh entered into the high-rise handlebar market with a model it touted as a “Wild New Fun Bike.” A sales pitch that read more like a car ad than a bicycle promotion pushed the chopper into the public eye and rocked the British bicycle world. The Chopper featured “extras” unlike any of it’s predecessors, like a dragster seat designed to provide a “rocking chair ride,” single or dual stick shifting in a top tube mounted “console” designed to change the three or five speed Sturmey Archer Hub gearing, different sized wheels with slick and studded tires, chromed roll bars and fenders, and a variety of colors and styles. The list of Chopper extras goes on. As Raleigh moved further into the recreational bicycle market, it was saved from the declining commuter bicycle market that previously sustained it. Raleigh, the “traffic-beating, mind-blowing, body-building, shop-hopping, fare-saving, Tour-de-France winning, boot-fitting, rip-roaring bike” was working its way into every age group and niche. Raleigh continued its innovative foray into bicycle design in 1976 with the Grifter, a design now seen as a precursor to popular BMX models. The heavy-framed bike with its motorcycle styling influences and throttle-like shifting became the next fad in bicycles. Unfortunately for Raleigh, it banked on the Grifter’s 3-speed setup and missed out on the initial BMX boom. Raleigh may have altogether missed the BMX boom were it not for a cycle-savvy secretary named Yvonne Rix, who had an interest in bicycle marketing and worked to bring the company into the BMX era with the Burner. The Burner series firmly moved Raleigh into the 1980s and a product relaunch emphasized the bike’s lightweight rigidity. Extensive use of ovalized Cro-moly tubes made the Burner a seriously desirable BMX bike and millions sold worldwide. The Burner was even featured in its own board game produced by Waddingtons in 1985. While BMX was making a mark amongst the youth of Europe and North America, a smaller revolution in the bicycle world was firing up from the west coast of the USA. In Cupertino, California, a group of bikers known as the Morrow Dirt Club began experimenting with modifications to old one-speed bikes that rendered them worthy of friendly competition on dirt. Joe Breeze, one of the legendary Repack riders of Mt. Tamalpais, is credited by many as the first actual builder of a mountain bike. Tom Ritchey, Gary Fisher and Charlie Kelly were among the innovators who helped Breeze bring mountain bikes to public acceptance during the late 1970s and early 1980s, starting a trend that continues to diversify and grow even today. On a trip to the USA, Yvonne Rix picked up on the notion that mountain biking was the next hot thing in cycling. Despite the fact that Raleigh saw mountain bikes as ridiculous in mountain-less countries like England, Rix persevered for several years until finally the company agreed to give the genre a formal go. Unfortunately, mountain bikes were not a popular item for Raleigh until 1987 when things changed drastically and a private company named Derby bought Raleigh a full 101 years after being started in that small workshop. Derby dismissed many of Raleigh’s upper management, promoted Yvonne Rix and saw annual mountain bike sales climb into the millions of units as buyers of all ages jumped on the bandwagon. Rix, with her marketing ingenuity, predicted a shift in the needs of bicycle buyers. She anticipated that average cyclists would appreciate many of the features offered by mountain bikes — such as the upright position and wide gearing range — but that they would quickly lose patience with the weight of the bikes and rolling resistance of knobby tires. Before retiring in 1988, Rix introduced a battery-assisted bicycle. The product was, unfortunately, a short-lived flop which retired not long after Rix. Mountain bike popularity grew rapidly in the late 1980s and early 1990s, especially in the U.S. market. 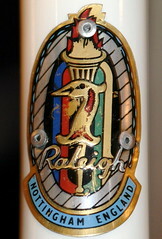 Raleigh eventually noted a market for higher-end mountain bikes designed and spec’d for off-road riding and racing. Raleigh’s M-Trax brand of mountain bikes was launched as a competition line and a team was established to support the brand in 1989. Raleigh changed it’s marketing tune to reflect a belief that the bikes it created must include the highest-end possible and a Special Products development unit was set to the task of creating the ultimate racing machines for Raleigh’s mountain bike team. In the 1990s it was becoming apparent that the facilities at Nottingham were no longer efficient for the level of production that Raleigh had achieved. A look at restructuring the company led Derby to announce in 1999 that the Nottingham facilities would cease to manufacture bicycles, limiting its operations to painting and some assemblies. The change was seen as a blow to the workers and residents of Nottingham, who saw Raleigh’s place as monumental in the history of their town. For Derby, however, the closure was just one step in a plan to make Raleigh a company that could compete globally, not just on a national basis. For some perspective, Accell Group has around 2,800 employees in 18 countries, with its own support facilities for the assembly and spray painting of bicycles in six countries worldwide. In 2014, Accell Group sold a total of 1,700,000 bicycles in more than 70 countries (including export). The group booked a total turnover of €882 million that year. It is traded on the official market of Euronext Amsterdam and included in the Amsterdam Small Cap Index (AScX) under the symbol ACCEL. 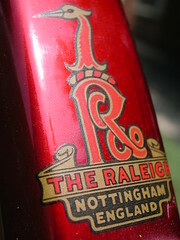 Raleigh produced bikes in Vietnam, Thailand and Sri Lanka until recently. They maintain a distribution center near Nottingham but bicycle production and assembly have ceased there entirely. As the quality of bicycles produced in the Far East improved, Raleigh joined many other bike companies in a push to farm out manufacturing in an effort to improve price points, increase sales and remain competitive. The extent to which Accell Group maintains these relations or moved them elsewhere remains unknown. And that’s o.k. Undoubtedly that same bang for your buck enticed my quality-conscious father to buy my first Raleigh — and Frank Bowden to purchase the company that ultimately led the bicycle industry’s industrial revolution. Who knows? Maybe there’s another young girl out there somewhere waiting to have her passion for cycling discovered on a Raleigh. Thanks for the mention. Was this article published somewhere other than on the Internet? Check out my site. How about a link? Great read. Thank you for the detailed insight. Raleigh bikes were a big part of my childhood. The article you are mentioned in was published exclusively on http://www.ebykr.com. Please support the EBykr effort by telling all your friends about the site. The Raleigh history you’ve provided here is comprehensive and a quick read. That is now easy feat! I especially enjoyed the info on the later years. I just read “The Story of the Raleigh Cycle,” while retrofitting a 1973 Super Course for long distance cycling. The book was written by Sir Frank Bowden’s great grandson, and published in 1975. It is definitely an item the vintage bicycle afficianado should have on the bookshelf or the coffee table. If you are restoring a Raleigh, or updating one as I did, reading this book makes the experience even richer. I have a Raleigh Park Place-ladies bike could you tell me how old this bike is?